Apple Pay Setup: What Is It, and Why Should I Use It? 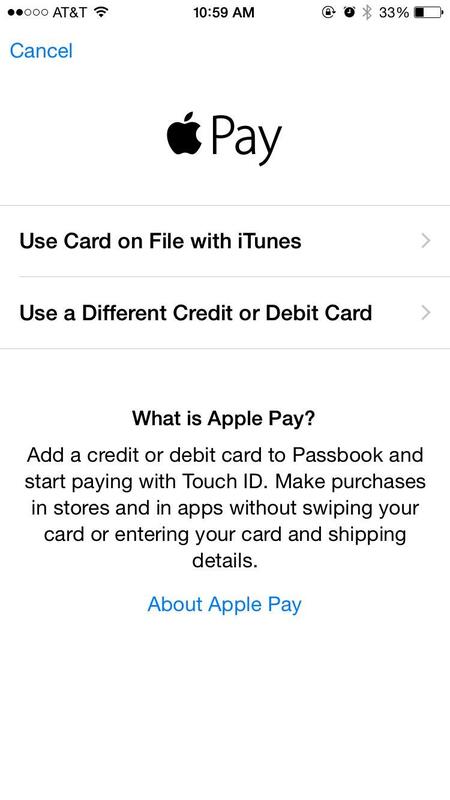 Apple Pay is finally available to use with the release of iOS 8.1. No doubt a lot of iPhone 6 and iPhone 6 Plus users around the U.S. are already frantically adding their preferred debit and credit cards. You’re not alone. Soon after downloading Apple’s latest software, I opened Passbook up to see just how easy it was to add my information. Turns out Apple Pay is pretty simple to setup. Everything is handled directly through the Passbook app which, let’s be honest, you probably haven’t opened up until today unless you’re a frequent flyer or head to Starbucks often. The idea of handling all of your payments digitally—no need for a physical wallet—has been promised for years now, and so far no one service has caught on. But the support behind Apple Pay so far has been overwhelming, so we have high hopes for the company’s new service. Apple says more than 500 banks will support Apple Pay down the road, with more than 220,000 stores and counting already accepting the service; that includes Office Depot, Petco, McDonald’s, Subway and many more to come. You can also use Apple Pay in a number of apps, including Target, Panera Bread, Staples, OpenTable, among others. This is only the beginning, too, and wider support is likely to roll out as more and more people use the service. Apple has reportedly sold millions and millions of its iPhone 6 and iPhone 6 Plus so far, which means there could be a lot of folks using Apple Pay this holiday season (and beyond). The idea of Apple Pay is a little daunting at first. My wallet, but in my phone? I don’t feel right when I forget my wallet; obviously I need it to pay for gas, food, and whatever else it is I need. So the prospect of leaving it at home is bringing up feelings of separation anxiety, like somehow I’ll still need it. But I think Apple has set Apple Pay up in such a way that those feelings will disappear over time. If you do decide to participate in Apple Pay, it’ll (in theory) be super easy at the point of sale. In conjunction with Touch ID, you’ll be able to make purchases with a single touch at stores that have the right payment terminals. Apple says you just need to hold your iPhone 6 or iPhone 6 Plus near the contactless reader with your finger on Touch ID, and that’s it. Your payment should go through right away, no need to fiddle with your wallet or enter in your PIN number. A beep or vibration will let you know the transaction was successful. At Apple’s most recent iPad event, a small terminal was set up that showed off Apple Pay in action, and our own Jon Rettinger was really impressed by how seamless and fast the service was. Of course, that was in a controlled environment, so experiences will definitely vary at an actual retailer. But the tools right now are setup to make Apple Pay incredibly intuitive and simple. You can catch a live demonstration here. But how do you actually set it up? Well, that part is really easy. 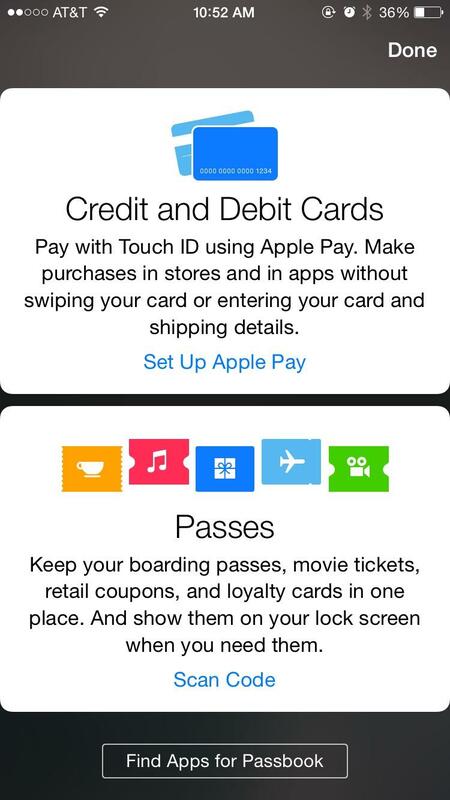 When you launch Passbook, just tap that little “+” icon in the upper right hand corner, and select the option to add your card; Apple will prompt you with options to either use a card on file with iTunes, in which case you need to re-enter your card’s security code, or use a different credit or debit card. I chose to enter in a different card entirely. The next screen that pops up includes all the necessary details, including your name, card number, expiration date and security code. The process is incredibly easy; you can either manually enter in your card number or simply take a picture, which then inputs some of the details (save for the security code) automatically. It worked perfectly for me, though others here in the office reported they had to input their card number manually; in one instance we actually had to call the bank to verify the card for Apple Pay. 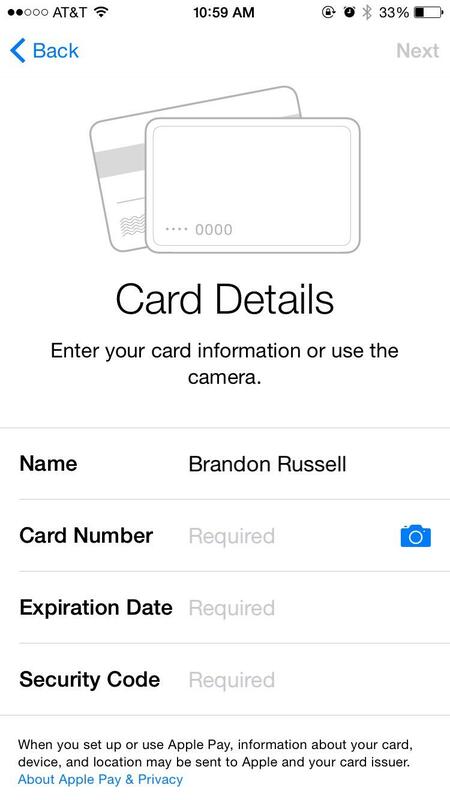 If you do choose to have Apple Pay enter in your card information automatically, the camera will open with a small outline in the shape of a card. 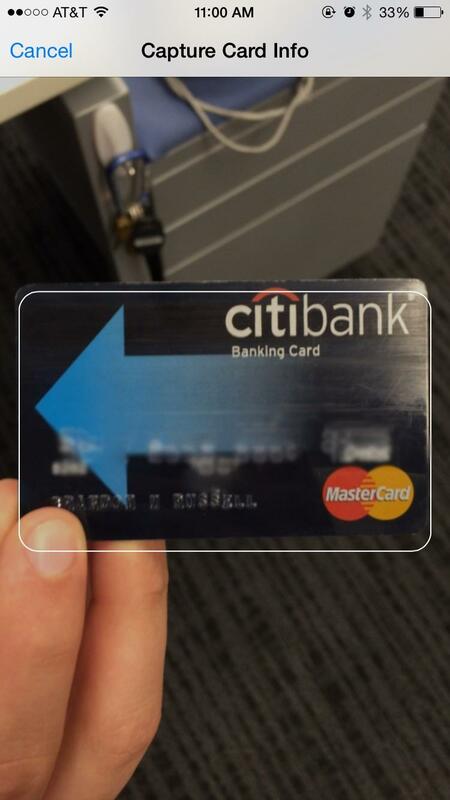 You just need to hold your card in the frame, and the app will take care of the rest. Again, it’s really easy and seamless, and requires hardly any effort. 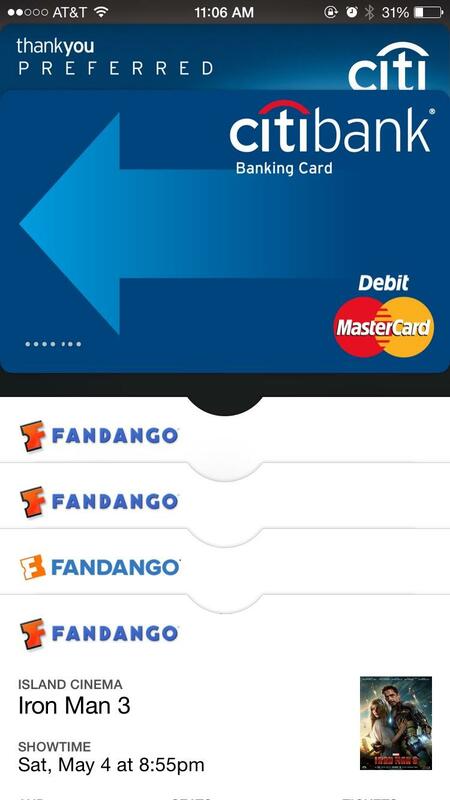 Once all the necessary information is filled out, you’ll be taken back to the main screen in Passbook, which will tell you whether your card has been activated or not. I have CitiBank, and things were up and running in no time; it took a second for activation to go through, but now it says I’m ready for Apple Pay. When a card is entered, you’ll be able to see your information on that particular card, including the option to remove it. When multiple cards are put in, you can make one the default, and arrange them however you want. 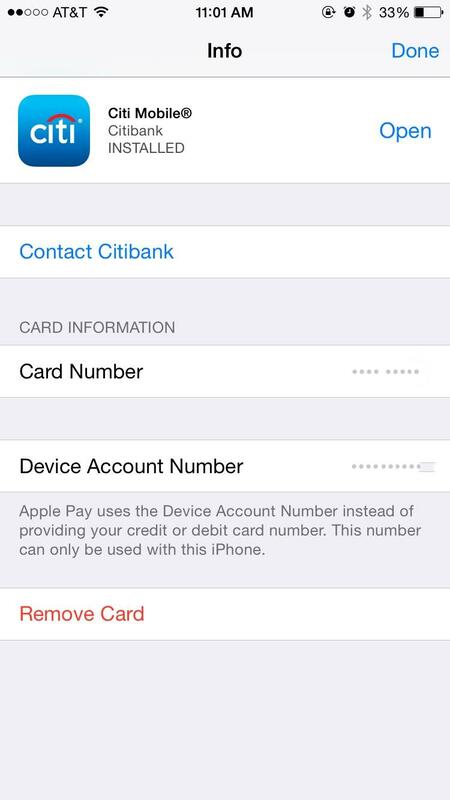 There’s also a Device Account Number attached to each card added, which Apple says the service uses instead of providing a credit or debit card number; the number you’re given can only be used with the iPhone you input your card information on. Apple put a major priority on security when Apple Pay was first introduced, ensuring you should have no worries when using the service. Apple says the Device Account Number that’s assigned is encrypted and securely stored in a dedicated chip on your iPhone, so no other third-party services have access to it. The Device Account Number is used at the point of sale, along with a transaction-specific dynamic security code, to process the payment. “Your actual credit or debit card numbers are never shared by Apple with merchants or transmitted with payment,” Apple says on its website. And if your phone is ever misplaced or lost, Apple says you can easily suspend Apple Pay from a computer. 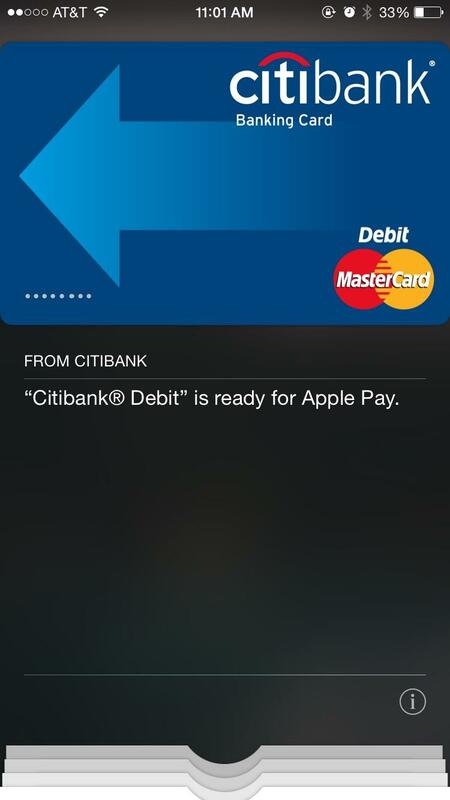 Apple Pay is already shaping up to be the next frontier of the digital wallet. For it to truly replace your wallet completely, however, it’ll need universal support from places like restaurants, hotels, airports, etc. I can easily go into a Subway and buy a sandwich, but I’ll still need my wallet at a restaurant. Still, at retailers, fast food restaurants, gas stations and drug stores, the ability to pay with your phone should attract quite a few Apple users to the service over the coming months. We haven’t yet tried it out in person, so there’s no telling just how seamless and easy Apple Pay will be out in the real world. But so far the service is really easy to setup, and the extra layers of security should put a lot of paranoid minds at ease. Now it’s just a matter of separating from your physical wallet once and for all.